Using the best cordless water flosser is a simple, effective way to give your teeth a deep clean. You can get into all the hard-to-reach places that you just can’t reach with a toothbrush and floss. So, if you want to know how to choose the best cordless water flosser, you’re in the right place. We researched some of the best ones around to put together this guide. First, let’s look at some of the key things to keep in mind. Waterproof: All of these water flossers are waterproof which comes in really handy for cleaning. Just run them under water and wipe with a soft cloth. Plus, you can even take some of them in the shower with you! Pressure Settings: There are 3 pressure settings to choose from on each of these products, typically soft, normal, and high-pressure pulse. Most manufacturers recommend starting with soft and working your way up appropriately. FDA Approved: FDA approval isn’t really necessary. Honestly, of our picks, some are, some aren’t. There’s actually a product on our list that’s not FDA approved but is supported by the ADA. No need to worry, any of these are safe. Flossing Tips: All of these products come with at last 2 tips. One actually comes with 7! Sometimes, there are different kinds of tips, other times there are multiple tips so everyone in the family can have one. Reservoir Capacity: This tells you about how long the water in the reservoir will last or how much water it holds. Typically, they last roughly 1 to 2 minutes and hold about 6 ounces of water, though this varies from model to model. Warranty: Warranties on these products range from 45 days to 2 years. As with all warranties, the longer the coverage, the better. Make sure you read the fine print carefully so you know what to expect if something does go wrong. Now that you know what to look for, let’s move into our reviews so instead of wondering, “What should I look for in a cordless water flosser?”, you can actually get started finding the right one for you. If you’re in a hurry, start at the top of the list with our top and budget picks. They really give you a great idea of the range that’s available. Keep reading if you can, all of these products are awesome. Okay, let’s go! First up is our Waterpik cordless water flosser review for the WP-560 Water Flosser. 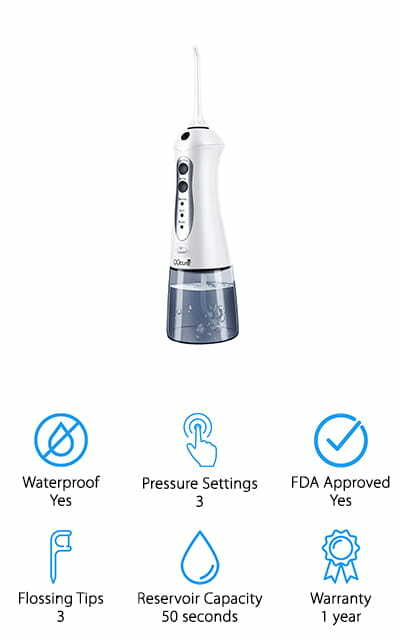 This product is approved by the ADA and delivers advanced flossing with 3 different pressure settings and 45 seconds of water capacity. It comes with 4 different flossing tips. In addition to the standard flossers, you also get a plaque seeker and orthodontic tip for anyone with braces as well. This is a great choice for travel. The convenient LED indicator light lets you know when it’s time to recharge and the rapid magnetic charging system gives you a full battery in only 4 hours. Plus, it comes with a microfiber travel bag, tip storage case, and is compatible with 100 or 240 volts. The WP-560 is also waterproof and can be used in the shower. 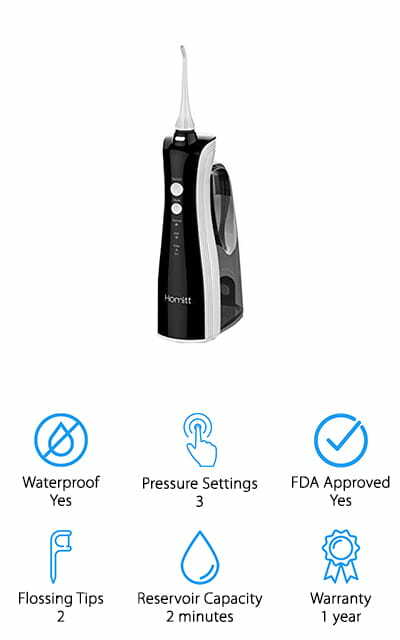 A great cordless water flosser if you’re on a budget is the Homitt Cordless Water Flosser. 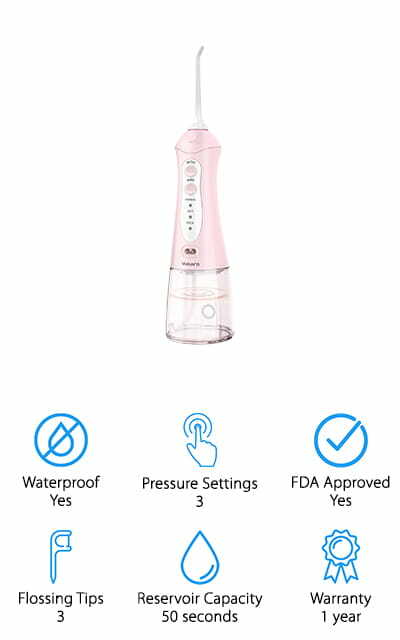 The large 330ml reservoir capacity has a 2-minute run time and has an auto timer that turns off after 2 minutes of inactivity to save battery life. It has 3 pressure modes and 360-degree rotatable tips to help you get to those hard to reach areas. There are 2 nozzles included, too, so even if you have braces or dental implants you can just choose the one that works best for you. A full charge can last up to 14 days depending on use which makes this a really great option for traveling. The water chamber is easy to fill and clean and the whole thing is waterproof so you can even take it in the shower. Another great option is this Panasonic cordless water flosser, EW1211A. It has 3 different settings. One for deep targeted cleaning, one for everyday cleaning, and a lower speed option for children or anyone with sensitive gums. With 1500 pulses per minute, it penetrates deep between teeth and gets food and plaque in places that normal brushing and flossing just can’t reach. Because it’s waterproof, you can take it in the shower with you to save time with your morning routine then rinse it under the faucet and dry with a soft cloth for cleaning. The water reservoir holds 4.4 ounces of water which gives you about 115 seconds of cleaning time. It’s easy to detach and fill plus its dishwasher safe for a deep and thorough clean. Next up in our best cordless water flosser reviews is this product from GooBang Doo. 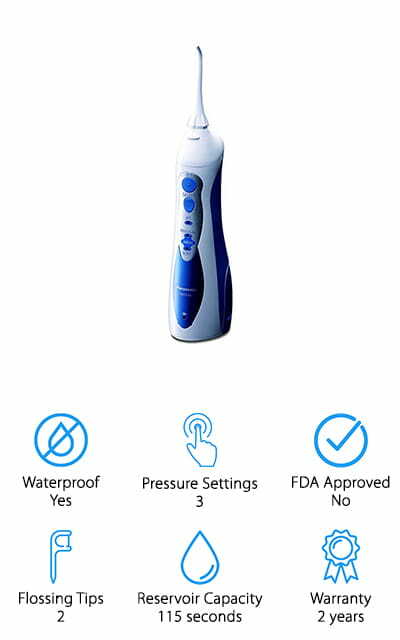 It features 3 flossing modes of normal, soft, and pulse to meet a variety of oral care needs. There’s also a memory function that remembers the last setting used. A 2-minute auto shut-off timer helps make sure you don’t run down the battery. Depending on use, a full charge can last up to 10 days and it recharges using the included USB cord that you can plug into a computer, power bank, or car charger. This flosser pulses at 1800 times per minute and comes with 7 different rotating long jet tips which are enough for the whole family. This flosser also comes with a 100% refund guarantee or replacement guarantee within the first 12 months. 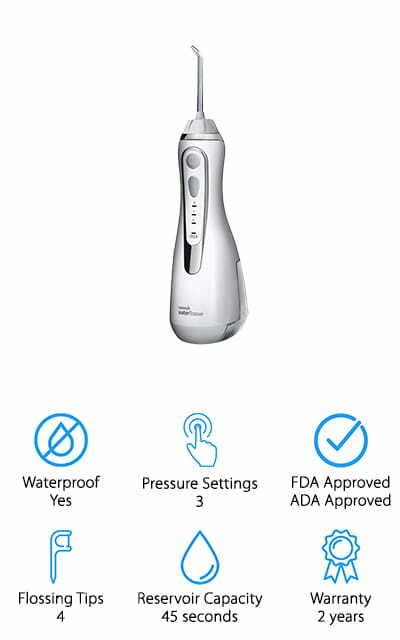 For a flosser that’s specially designed for periodontitis, take a look at the DLIUZ Cordless Water Flosser. Choose either normal, soft, or pulse mode depending on whether you’re looking for normal cleaning, gentle cleaning for sensitive gums, or pulse mode for deep cleaning and massage. It has a memory mode, too, and a 2-minute auto-timer that helps save battery life. An upgraded easy-to-fill water tank lasts for a full 60 seconds of cleaning. Although the battery takes 8 hours to fully charge it lasts up to an impressive 50 hours. This flosser comes with 3 color-coded interchangeable nozzles to share with 2 other family members. Everyone will easily be able to tell which nozzle is theirs. There’s also a 1-year refund and replacement guarantee so, seriously, what do you have to lose? 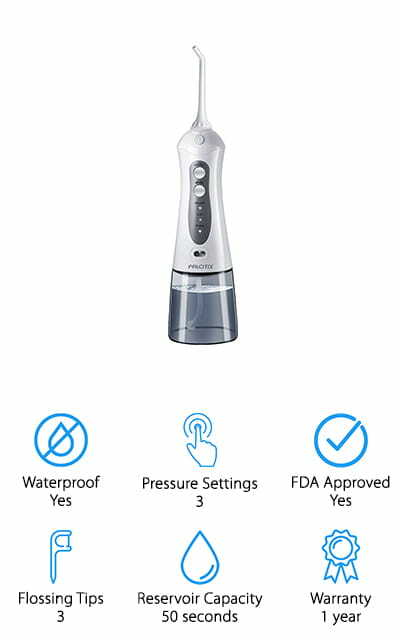 The Greenvida Water Flosser is a great oral care cordless water flosser that features a high water pulse of 1400 times a minute. It comes with a 6-ounce water reservoir that’s more than enough to get your whole mouth clean. There are 3 modes for normal, soft, and pulse cleaning and 4 flossing tips included so you can share with family or pick and choose which one works best for you. The waterproof design is safe to use in the shower and the battery lasts for up to 14 days of use with a full charge. When the battery is low, use the included USB cable for a full charge in only 8 hours. It’s a great choice for travel because it’s so portable and even includes travel bag to keep everything together. Up next in our cordless water flosser reviews is the Vosaro Cordless Water Flosser. 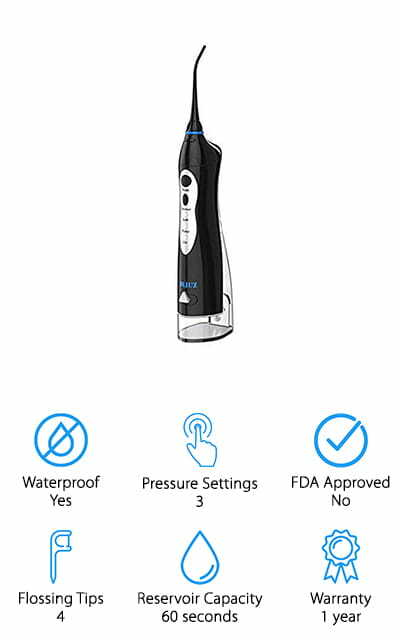 This portable design has 3 different settings that range from 1400 to 1800 pulses per minute to deeply clean your teeth and gums in places you just can’t reach with a toothbrush and floss. The water reservoir holds enough water for 50 seconds of cleaning and opens easy when it’s time to refill or clean. This is a great choice for travel because it uses a simple USB cable to charge and can last up to 4 weeks with a full battery depending on usage. There are 3 different flossing tips included, too, so you can choose the one that works best for you. This flosser also comes with a 30-day money-back guarantee and a 1-year replacement warranty. 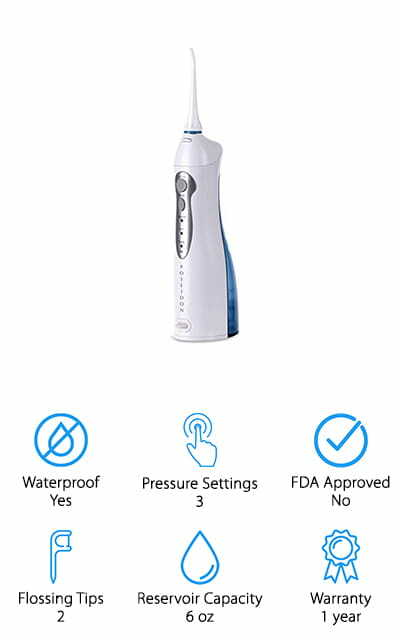 Another great choice is the QQcute Cordless Water Flosser. It delivers a superfine stream of water at 1700 pulses per minutes and is a great choice for braces, implants, and bridgework. This lightweight design is portable and perfect for travel. One of the best things about this design is the water tank. It holds 200 ml of water or mouth rinse which is enough for 50 seconds of flossing. There’s more, it also removes completely so it’s easy to refill and keep clean. You can choose from 3 different settings: soft, pulse, or normal. There’s also a memory feature that saves the last setting used so you don’t have to select your favorite ever time. A full charge lasts up to 2 weeks and recharging can be done anywhere using a simple USB cord. Next is the Oral Irrigator by Poseidon. The best thing about this one is the charging stand. Just keep it plugged in by your bathroom sink and all you have to do is put the flosser in place when you’re done. No more hunting for a charging cable or trying to find an open outlet in your bathroom. Don’t worry, the design is sleek and modern. It looks nice in your bathroom and doesn’t take up a lot of counter space. If you use the charging base after every use and you floss once in the morning and once at night, you’ll have a full charge, every time. The Oral Irrigator includes 2 color-coded tips so you and your partner can easily identify the right tip and comes with a 1-year warranty. Last up in our cordless water flosser review is the Palotix Cordless Water Flosser. It has 3 operational modes ranging from soft to pulse mode with 1400 to 1800 pulses per minute. It’s perfect for people with braces, implants, or anyone who just wants a deep, thorough clean. Because it’s waterproof, you can use it in the shower and the reservoir won’t leak thanks to the exclusive patented design. Cleaning is easy, too, because the water reservoir removes completely so you can quickly and easily take care of any limescale or bacteria. This is a great option for travel because it lasts for up to 2 weeks on a fully charged battery. When it’s time to charge, use the included USB cable and connect it to a power bank, laptop, or use the included charging block.